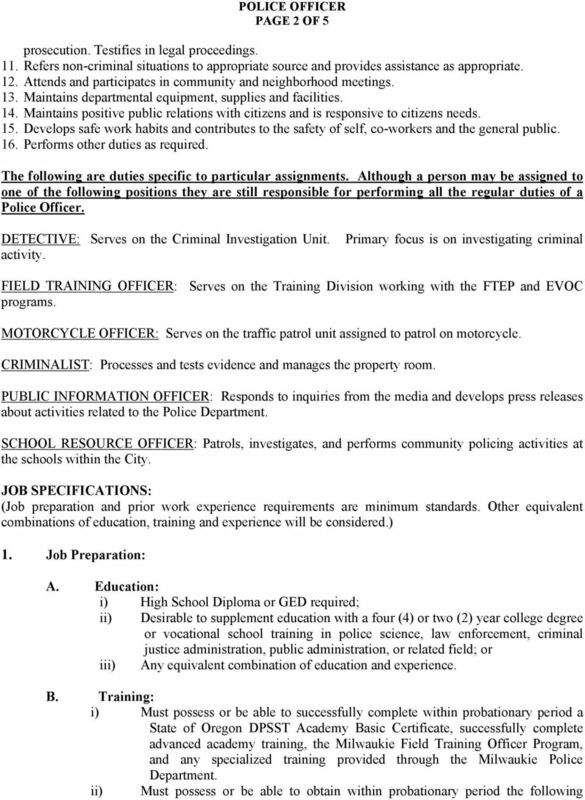 Download "CITY OF MILWAUKIE CLASSIFICATION: POLICE OFFICER DESCRIPTION:"
3 PAGE 3 OF 5 certifications: L.E.D.S. certification for access Intoxylizer First aid CPR 2. Prior Experience: a) Work Experience: i) Two (2) years prior work experience in a related field; or ii) Any equivalent combination of education and experience. b) Necessary Knowledge, Skills and Abilities: i) Some knowledge of modern law enforcement principles, procedures, techniques, and equipment. ii) Some skill in operating the tools and equipment listed below and skill in observation and remembering details such as names faces, and incidents. 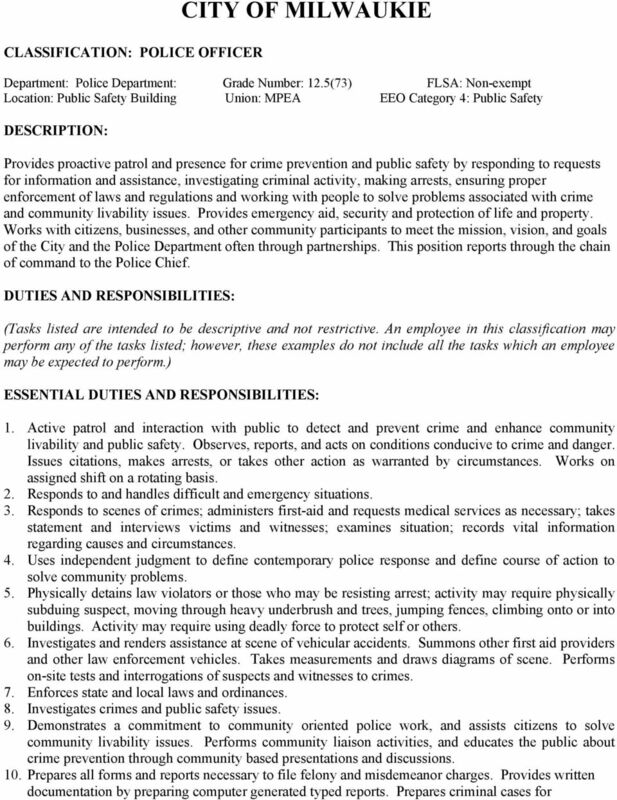 iii) Ability to learn and apply the applicable laws, ordinances, department rules and regulations, principles, and techniques of community policing, modern crime prevention, investigation, apprehension, rules of evidence, and all other aspects of law enforcement. 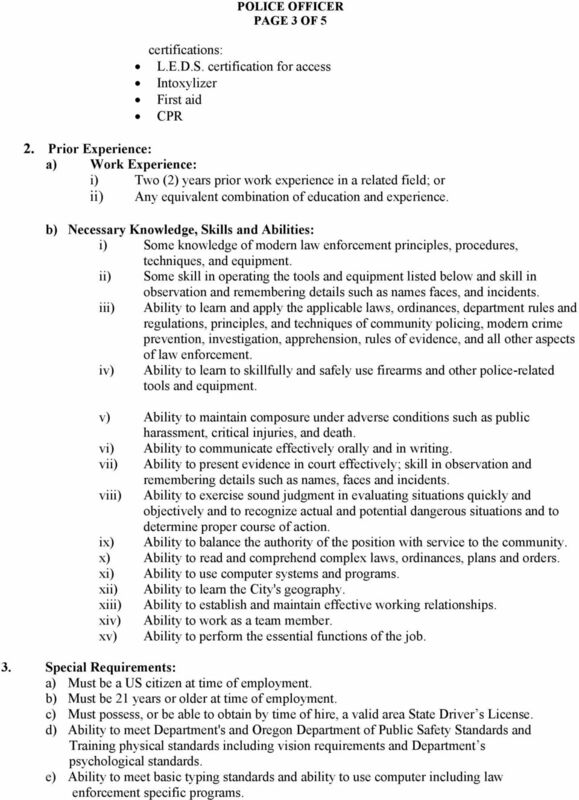 iv) Ability to learn to skillfully and safely use firearms and other police-related tools and equipment. v) Ability to maintain composure under adverse conditions such as public harassment, critical injuries, and death. vi) Ability to communicate effectively orally and in writing. vii) Ability to present evidence in court effectively; skill in observation and remembering details such as names, faces and incidents. viii) Ability to exercise sound judgment in evaluating situations quickly and objectively and to recognize actual and potential dangerous situations and to determine proper course of action. ix) Ability to balance the authority of the position with service to the community. x) Ability to read and comprehend complex laws, ordinances, plans and orders. xi) Ability to use computer systems and programs. xii) Ability to learn the City's geography. xiii) Ability to establish and maintain effective working relationships. xiv) Ability to work as a team member. xv) Ability to perform the essential functions of the job. 3. Special Requirements: a) Must be a US citizen at time of employment. b) Must be 21 years or older at time of employment. c) Must possess, or be able to obtain by time of hire, a valid area State Driver s License. d) Ability to meet Department's and Oregon Department of Public Safety Standards and Training physical standards including vision requirements and Department s psychological standards. 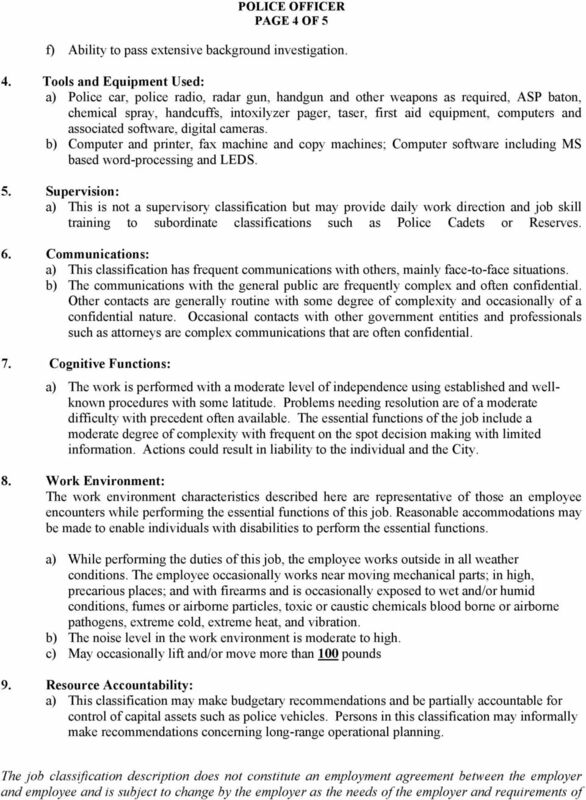 e) Ability to meet basic typing standards and ability to use computer including law enforcement specific programs.